This Detail Data map contains details on the number of road traffic collisions leading to injuries that occurred within a 100m area around each school in Northern Ireland, occurring on weekdays 2005-2014. Zoom in on the map to view individual school sites. The crash data was obtained from the PSNI and the geographic data was obtained from the Department of Education. Where a collision occurred within 100m of more than one school they are mapped to each but are only counted once in the overall figures. The circles represent the 100m radius surrounding each school in Northern Ireland. The colour of the circles relates to the number of road traffic collisions that occurred close to each school. The data relating to school location is based on the addresses recorded by the department for the 2014/15 school year. Click on the ‘show collisions on map’ link at each school to see exactly where each collision took place. Of the non-fatal casualties, over 200 had injuries considered ‘serious’. The remaining were recorded as ‘slight injuries’. Using PSNI statistics, Detail Data has mapped every road traffic collision (RTC) resulting in an injury close to a school over ten years. We only examined collisions which occurred on weekdays within one hundred metres of a school, between 2005 and 2014. There were 1,766 collisions in total. Detail Data’s investigation has shown that almost one fifth (18%) of those injured close to schools were aged 16 or under, a higher rate for this age group when compared to collisions regardless of location (11.9%). The Department of Infrastructure was unable to confirm how many schools across Northern Ireland are located next to 60mph roads. However, our analysis found 78 schools where collisions had occurred nearby on 60mph roads. Including pre-school, primary, post-primary and special schools there are over 1,500 schools in Northern Ireland. However only three schools currently have part-time temporary 20mph speed limits and a further three schools are earmarked to have these measures put in place. Electronic flashing signs at the beginning and end of the school day are used to highlight the change of speed to 20mph and legislation is required for police to enforce the speed limit. We have spoken to two principals whose primary schools are both situated on 60mph roads. Despite the fact that they are located in the same county, only one of the schools is currently in the process of getting part-time 20mph speed reduction measures put in place. Commenting on the use of part time 20mph speed limits she added: “It is worth noting that in other countries where default 20 mph or 30 kph speed limits outside schools have been adopted, research reports note that, unless it is aggressively backed up with police enforcement, these reduced speed limits quickly fall into disrepute by drivers. Responding to Detail Data’s findings, PSNI Road Policing Inspector Rosemary Leech said: “We are happy to participate in the process that attempts to prioritise applications and sites that have been identified as being suitable for such a scheme. The widespread roll-out of such schemes places a significant enforcement burden upon police. Inspector Leech added that police take a number of steps to ensure greater road safety at schools: “We respond to requests for enforcement of speed which involve school crossings and school keep clear zones. Our interactive map was created using PSNI road traffic collision statistics collected between 2005-2014 and Department of Education co-ordinates for every school in Northern Ireland, from pre-school through to post-primary. The data relating to school location is based on the addresses recorded by the department for the 2014/15 school year. We analysed 1,580 schools across Northern Ireland. 596 had at least one RTC which caused an injury within 100m of the school site during a weekday in the ten year period. For example St Mary’s Primary School on Divis Street in Belfast is located near to the Westlink. Approximately 13 of the 36 RTCs within the 100m radius of this school appear to have occurred on the dual carriageway or on the slip road leaving the dual carriageway. The data shows that during this period there were 1,766 weekday collisions resulting in 2,660 casualties. 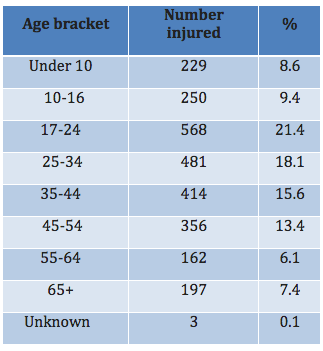 Of those injured 479 (18%) were aged 16 and under. Of the eleven deaths recorded one person was aged 10-16. The most common time for RTCs near schools was between 3pm-4pm (10%) followed by 8am-9am (8.9%). For an interactive breakdown of when the collisions took place over the last ten years click here. Between 2003 and 2006, the Scottish Government provided funding and specific authorisations to local authorities to introduce part-time 20 mph speed limits around schools. The initiative saw the vast majority of local authorities put these in place around all their schools. However Rod King from the UK-wide campaign group 20’s Plenty believes temporary speed limits outside schools only partially addressed the issue of speeding on roads. He said: “Whilst there may be a case for making some 20mph limits temporary outside schools which are on main roads, this does not solve the problem of vehicle speeds being too high across the community. In Northern Ireland only Kilmoyle Primary School in Ballymoney, Hexlett Primary School in Derry and Templepatrick Primary School in Antrim have had specific legislation to enforce temporary 20mph speed limits. The Department of Infrastructure said implementation can only take place with the support of the PSNI, the successful completion of the necessary legislation to allow enforcement and the availability of resources including finance to allow delivery. There are three schools in Newry, Armagh and Craigavon where the legislative process for part-time 20mph speed limits has begun. These schools are located next to 60mph roads. Construction is already underway on the signage for the temporary 20mph speed limits outside St Peter’s Primary School in Collegeland Co. Armagh. Its principal Jim McAlinden says the school has campaigned for the measures for over four years. He said: “It really is a situation where parents and community groups raised awareness and lobbied to have the speed limit changed. We are a rural school with a 60mph stretch of road right outside our gates. Understandably parents were concerned about the risk to their children particularly at the start and end of the day. Lorraine Quinn has two children who attend the school and has had personal experience of how dangerous a 60mph road can be beside a school. The new speed limit arrangements are expected to be functioning outside St Peter’s in time for the new school year in September. However just 30 miles away, Killean Primary School near Jonesborough is also situated on a 60mph road, but there are no plans at present to introduce temporary speed limits at the site. The school’s principal Louise Campbell said: “We are situated in beautiful area in rural south Armagh, as such there are quite narrow roads. If you can imagine cars and heavy goods vehicles driving down the road at 40, 50 and even 60mph. A study was carried out by the Department for Regional Development in June 2014 to examine the most effective traffic calming measures for outside schools across Northern Ireland. It found that there were a number of engineering measures which can be introduced to create safer roads around schools such as coloured markings, central reserves and lay-bys. However the study concluded that the most effective system was the introduction of enforceable part-time 20 mph speed limits. Ms Leo believes more schools in Northern Ireland should have part-time 20mph speed limits. She said: "When you consider that we have more than a thousand schools across Northern Ireland and only a small number currently have those protections it is surprising. “Especially when you consider that many of our schools are beside main roads, with some at 60mph. We know the outcome can be much different depending on the speed of a car when a collision occurs. A spokesperson for sustainable transport chairty Sustrans said: "Detail Data has produced a really useful map showing collisions around schools and we are very supportive of 20mph but not just at school gates. We want safer journeys to schools for all children and therefore want a default 20mph in residential areas. "Government also needs to look at safer infrastructure to encourage more active travel i.e. children to walk and cycle to school. What we have at the moment is a vicious circle of parents afraid to let their children get to school on their own steam and as a result massive congestion around the school gates. "We deliver the Active School Travel programme on behalf of the Dept for Infrastructure and Public Health Agency which reaches 200 schools. We have just been funded to continue delivering this programme for 5 more years and hope to expand its remit." Click here to see Detail Data's previous investigation on two years of death and serious injury on Northern Ireland’s roads. Due to republishing restrictions contained in the licence from the UK Data Archive (which hosts the PSNI RTC datasets) we are unable to reproduce the datasets used for the purposes of this article in full. However, PSNI have committed to publishing their data under an Open Licence in the near future, and once that has happened we can then publish the analysed data. Readers interested in reproducing the analysis involved here for themselves can follow the method outlined here.